A way through the outside of the picture - a dead sound on the final stroke of nine. A slow process combined with the speed of an all-consuming retinal hunger sharing a bed with the unreliable fear of misunderstanding. A dark and fast exit - where the picture begins. 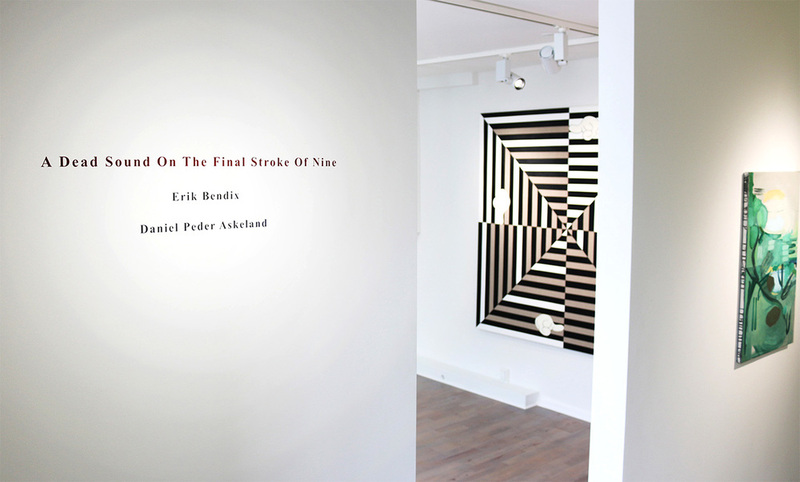 Daniel Peder Askeland and Erik Bendix can hardly be put together: Formally distinct from one another, the works that make up "A dead sound on the final stroke of nine" should be viewed in the light of what they are. A progression brought to a halt; continually re-negotiated. The possibility of the attempt; never fixed; coordinates interchangeable and often nilly willy. Two distinct ways of attacking an old problem. As a place where competitive bodies go, the works oscillate between synthetic fields of imagery and the extremely stylized. All excitement of the-wanting-to-read-reality catch potentially lie dead on the ground. The fascination with painting as a medium, carrying with it a long history of problematics, evoking a multitude of short glimpses (critical, comical, emotional), are transformed into gestures of doubt. A lie told, feeding its inherent language and preparing a picture of the whole. The structurally interrupted images play with conventional formats, creating a warped language of structural cracks, where the space in-between abstract ideas and imagery is explored. Repetitive gestures and static simplicity make room for discursive machines, pushing towards almost hallucinogenic surprising laughter.